Having a script tattoo can be a really beautiful way of getting a particular message across. However there are a lot of things that people overlook and a lot of things that can go bad. 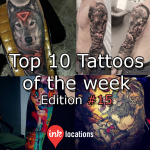 This is the fifteenth edition of InkLocation’s Top 10 Tattoos of the week! They are in alphabetical order to keep things fair! Featuring Alexis Vaatete (@alexisvaateteart), Andrez Niuniek Misztal (@niuniekrock), Chris Mata’afa (@chris_showstoppr), Darren Wright (@darrenwrighttattoos), Eugene Knysh (@levgen_eugeneknysh), Fred Flores (@fred_flores), Ivano Natale (@ivanonataletats), Jumilla Olivares (@jumillaolivares), Sean Foy (@sean_foy) and Xiao Peng (@guanxiaopeng). So, you’re thinking of joining the air force but you’re not sure of all the rules and regulations surrounding tattoos. The thing you’ll want to find out is where do you go to find all the rules & regulations? In the world of tattoos, placement is one of those things that will either mean everything to you or nothing at all. Some people are happy to slap their tattoo design anywhere on their body and be cool with it. Others think the placement plays a massive role into the overall result of your tattoo. Your body isn’t just a flat canvas that’s never moving, so you really need to put a lot of thought into where that particular tattoo is going to look best. You also can’t just rely on your tattoo artist telling you if you picked a bad place for a tattoo. It’s something you really need to put a lot of thought into yourself. 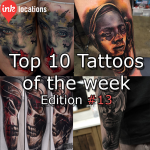 This is the fourteenth edition of InkLocation’s Top 10 Tattoos of the week! They are in alphabetical order to keep things fair! Featuring Cigla (@ciglatattoo), Dave Paulo (@davepaulo_tattooartist), Erich Rabel (@erichrabel), James Strickland (@jamesstrickland), Jun Cha (@juncha), Mike Randazzo (@mikendazzoart), Moni Marino (@moni_marino_artist), Oleg Shepelenko (@olegtattoo), Robert Ekman (@robertekmantattoo) and Sam Barber (@sambarbertattoo). With the rise in popularity of tattoos, it seems more common for people to have a tattoo than not. As our society changes perception on those who have ink, we wanted to promote the amazing quality of work that is available right here in Australia. This is to help people conduct their own research before getting tattooed and to help aware them of the different art styles that tattooists have. 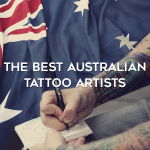 We personally reached out to what we consider the best tattoo artists in Australia, and have collated their responses along with photos of their work that show off their particular styles. We asked them a few simple questions such as, how long they have been tattooing, what influences they’ve had, how they would describe their specific style and if they plan to do any travelling? So without further ado, hopefully this large list of amazing tattoo artists will help you in your decisions of getting inked or if you’re just keen to follow some new artists on Instagram. 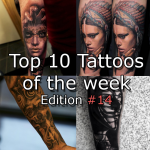 Welcome back to the thirteenth edition of InkLocation’s Top 10 Tattoos of the week! This week we put in quite a few artists that haven’t yet been featured. As usual, they are in alphabetical order to keep things fair! 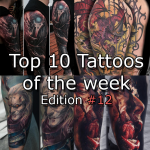 Welcome back to the twelfth edition of InkLocation’s Top 10 Tattoos of the week! There’s been a few weeks break but we will be back into full swing! Once again the amount of quality work being pumped out is insane, so massive apologies for all the other awesome work that was done but couldn’t be included – we also try and mix up the artist each week. They are in alphabetical order to keep things fair! 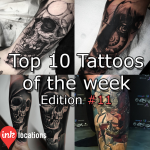 Welcome to the eleventh edition of InkLocation’s Top 10 Tattoos of the week! 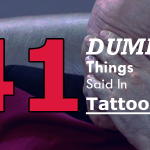 This week was extremely hard to limit to only 10 tattoos, so massive apologies for all the other awesome work that was done but couldn’t be included. They are in alphabetical order to keep things fair! As usual, if you see an awesome tattoo you that was completed during the next week – send it through to [email protected] to get it featured in next weeks edition!